A new kind of grocery store in Boston tackles both good-food affordability and food waste. Doug Rauch doesn’t care about food waste. Food waste to him is the scraps on your plate that get pushed into the trash. It’s the crumbs at the bottom of a box of cereal. What Rauch does care about is wasted food: Perfectly good tubs of yogurt, cans of beans, speckled peaches, and wilting veggies. Food that is going into a dumpster instead of making it from a field, warehouse, or grocery store onto the plate of someone who wants to eat it. He’s dedicated to combating food waste, through an innovative grocery store called Daily Table, in Dorchester, MA. Since ten percent of food is wasted at the retail level, the store serves as a model for how a business can help strike down barriers to good-food access in a community, while simultaneously tackling the problem of food waste. Rauch used to work in the upper management of a little grocery store you might have heard of: Trader Joe’s. In 2008, he retired after 31 years, including his last 14 as president of the company. He wasn’t sure what he was going to do next, but he knew it wasn’t going to involve a rocking chair. As unsure people often do, he went back to school. He became part of Harvard University’s Advanced Leadership Initiative, a program for established leaders looking to make a social impact. There, he learned about the extent that food goes to waste in the US: Between farmers and consumers, about 40 percent of food that is produced is thrown out or wasted, according to the USDA. With so much experience in the grocery industry, Rauch also became concerned by the problem of food access. The USDA defines a “food desert” in an urban area as a place that is more than a mile from a grocery store; in rural areas, the number changes to ten miles. When people live in food deserts, it’s more difficult to obtain healthy foods, especially if they are lower income and don’t have a car. So they may end up settling for what’s within reach — often, junk food snacks from convenience stores, or fast food. But Rauch found that even when people could get to the grocery store, it wouldn’t necessarily help them eat better. Foods high in sugar and salt are often cheaper than more nutritious options. 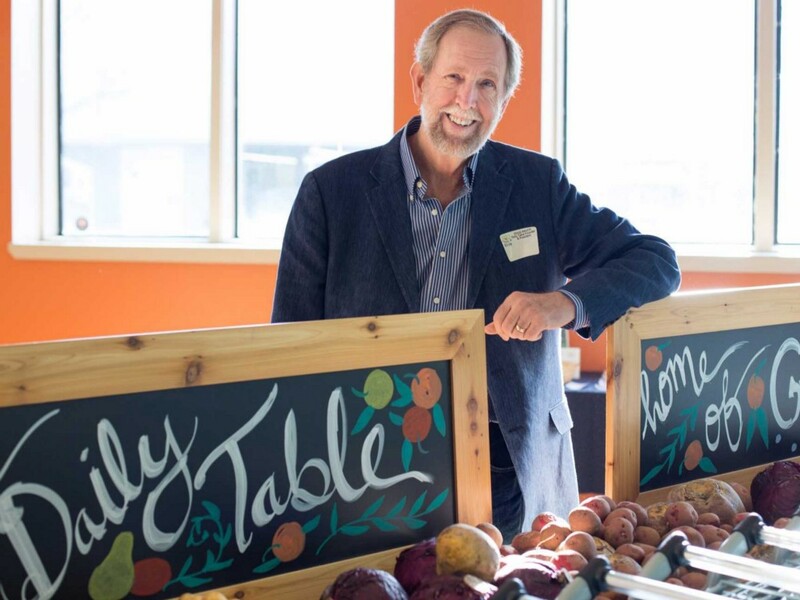 A 2007 paper from the California Law Review confirms and has a name for that problem: “food oppression.” So Rauch started a store called Daily Table to create a new model of grocery store that would address the twin problems of food insecurity and food waste. Doug Rauch, founder of Daily Table. Photo by Samara Vise. Daily Table sits in the heart of Dorchester, MA, Boston’s most culturally diverse neighborhood. While it’s not a food desert — there are plenty of grocery stores in the area — many residents do have trouble affording fresh, whole foods at every meal. Walking into Daily Table doesn’t feel like walking into a supermarket. Your average grocery store carries about 42,000 items as of 2014, according to the Food Marketing Institute, a grocery store trade group. Daily Table, on the other hand, is limited to 275 different products. Right from the start, you can see all four of the store’s walls — it has a largely open plan, with shelves along the perimeter, but not rows upon rows clogging up the middle. The warm lighting and friendly staff make it feel a lot like a small Trader Joe’s without the trademark Hawaiian shirts. Walmart might not be interested in milk only a week before its best-by date…But Daily Table is. It prices the food for quick sale — perhaps for half or two-thirds of what items would cost at a conventional store. Though limited, the store’s shelving is similar to what you’d find at a health food store. Refrigerated shelves stock regular grocery items like milk, yogurt and hummus. Dry-goods shelves on the far side of the store have things like bread, canned vegetables, beans, pasta, and peanut butter. In the middle of the store, bins (both refrigerated and not) have meats, fish, and fresh fruits and veggies. The store has a Nutrition Task Force that reviews the nutritional value of each item before approving it to be sold. The task force looks for low sugar and salt content, high fibers, healthy fats, and other factors that would be considered part of a balanced diet. Candy, potato chips, and soda are not products you’ll see on Daily Table shelves, never mind hundreds of types of them. But all of this isn’t what really makes Daily Table a unique model. Rauch compares Daily Table to Goodwill Industries, except instead of running on donations of clothes and furniture, it gets food donations directly from producers or manufacturers. The donated food generally doesn’t have enough time before its stamped “best-by” date to be sold to a grocery store. For example, Walmart might not be interested in milk only a week before its best-by date, or a canned good four months before. But Daily Table is. It prices the food for quick sale — perhaps for half or two-thirds of what items would cost at a conventional store. For example, Newman’s Own salad dressing has sold at Daily Table for $1.29 per bottle, compared to its $3.99 price at Stop and Shop (a New England grocery chain). Both paid staff and a group of regular volunteers help keep the store running. After a shift, which tend to average three hours, volunteers get a $2 coupon to the store. That might not sound like much, but volunteer Mike Moloney says it goes a long way toward getting a good lunch. Since Daily Table doesn’t give the food away, people don’t have to prove their income is low enough to get good food at a deep discount; they can just come in and shop. The original plan for the store had been to sell food that had passed its expiration date, since expiration dates often only indicate when a food is at peak freshness, rather than when it’s spoiled. After extensive research on the community it was moving into, founders of Daily Table realized they couldn’t sell expired food, safe or not. Community members, mainly people of color, were concerned that being seen as people who would eat old food not sold to wealthier, whiter customers would only increase negative stereotypes. Giving space for people of all incomes to shop in a “manner that honors our customer, engendering dignity,” is part of Daily Table’s mission statement, so it pulled back on its plan to sell safe food past its recommended “best by” date. Even so, the store manages to recover about 10,000 pounds of food each week that conventional stores would have already trashed. While launching Daily Table, Rauch and his staff soon discovered a high demand for prepared foods for busy people on the go. So it began offering some as a way to both meet that need and to find a purpose for even more food headed for the landfill. At the back of the store sits a professional kitchen. Shoppers can watch through a large window as prep chefs take produce and meats to create the prepared meals that will be on the shelves later that day or the next. Instead of fried burgers, the chefs whip up soups, prepared salads, or a plate with meat and sides that can be heated up at home. Here’s the best part: The chefs make use of food that might not be pretty enough to be sold fresh, like wilted greens or droopy broccoli, cooking it into something that is perfectly safe, healthy, and tasty. Daily Table prep chefs utilize “ugly” food to create safe, healthy, and delicious to-go meals. Photo by Samara Vise. Once or twice a week during his volunteer shift, Moloney often preps fruits and vegetables there while chatting with employees and volunteers. Since its launch in June 2015, Daily Table has been a resounding success. The store did a record $170,000 in sales in August 2016, an amount that may look paltry to big grocers. But, since prices are about half to a third of what conventional grocery stores charge, that would be equal to a regular grocery store selling $340,000-$510,000 based on less than one percent of its inventory. Daily Table’s basket/transaction size has increased since it opened by an average of 65–70 percent. It’s not just sales that show that Daily Table is making a difference. Cathy Schoen is a full-time mom who has been volunteering at Daily Table since it opened. Her 17-year-old son has worked at the store for two summers and plans to continue when he starts college in Boston next fall.